The images look pretty but indicate devastation on the ground below. New photos taken by a NASA satellite offer a unique perspective on the continuing eruption of Hawaii's Kilauea volcano, which since Thursday has destroyed dozens of homes and forced some 1,800 residents to flee the area. 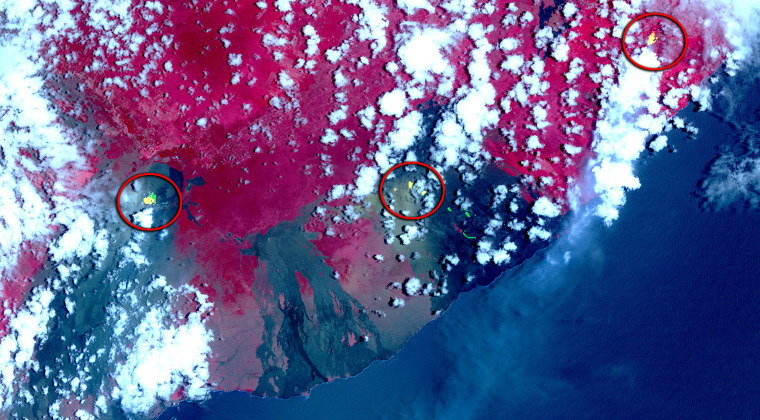 Taken on Sunday by an instrument aboard the space agency's Terra satellite, the two false-color photos show fissures along the volcano's East Rift Zone that are leaking lava and the toxic gas sulfur dioxide. The fissures look yellow in the first photo (above), with red representing vegetation and black and gray areas showing old lava flows. In the second photo (below), long plumes of sulfur dioxide — a colorless but foul-smelling gas that can irritate the skin and mucous membranes — show up as yellow and green streaks. "These photos are helpful to scientists, civil authorities, and the public in order to get the full picture of where new lava is flowing and where toxic gases are moving," Kayla Iacovino, a volcanologist at Arizona State University in Tempe, told NBC News MACH in an email. Since they can help experts predict the locations of future lava flows and gas plumes, she said, "these images can also aid in the creation of new volcanic hazard maps, which help the public make informed choices about where to build (or buy) a new home." Can the photos help predict where new eruptions will occur? In an email to MACH, Dr. George Bergantz, a professor of Earth and space sciences at the University of Washington in Seattle, declined to offer an opinion on that question. But he said that knowing the locations of the gas plumes is important because a mixture of air and volcanic gases known as "vog" can affect communities along the leeward side of the Hawaiian Islands. Kilauea, located on the southeastern side of Hawaii's Big Island, is considered one of the world's most active volcanoes. The Terra satellite, which was launched in 1999, orbits Earth at a distance of 438 miles above the planet's surface. In addition to keeping an eye on volcanic activity, its onboard suite of instruments helps monitor crop stress, coral reef degradation, glacier retreats, and other environmental ills.